Drummond Hill Walk, Loch Tay, Kenmore. Explore wooded Drummond Hill where the trees part occasionally to offer tantalising glimpses of Loch Tay and the surrounding countryside. 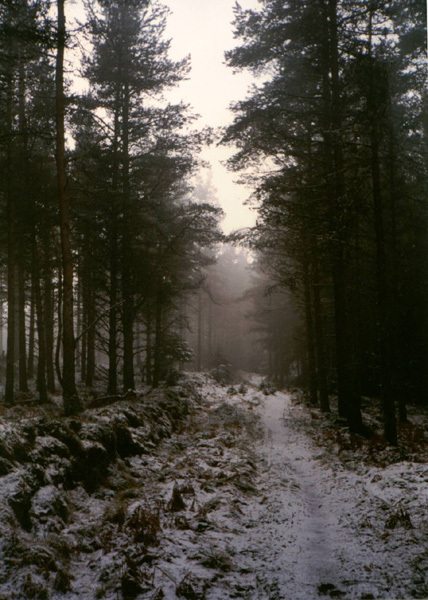 Drummond Hill at the north east end of Loch Tay is criss-crossed by forestry tracks and paths which combine to provide a network of routes for walkers and mountain bike enthusiasts. This outing climbs to the northern summit, home to a tall aerial standing proud above the surrounding trees, and takes in a viewpoint where there are panoramas over Loch Tay and Kenmore, a picturesque village at the head of the loch. The route encompasses both wide tracks and more discreet pathways where rusty red carpets of pine needle wind their way through the trees, sunlight penetrating the canopy of branches above to spray bright shafts of sunlight on to the forest floor. Try this walk first then explore the many other highways and byways of Drummond Hill. Pass through a kissing gate at the top end of the car park and follow a wide forestry track lined with silver birch trees, tall pines and rhododendron bushes. The track passes by a metal tank on the right to reach a junction where there is a wooden sign pointing to a 'viewpoint'. Turn right here and follow the track as it rises through the birch, beech and larch trees lining the bracken-covered hillside. 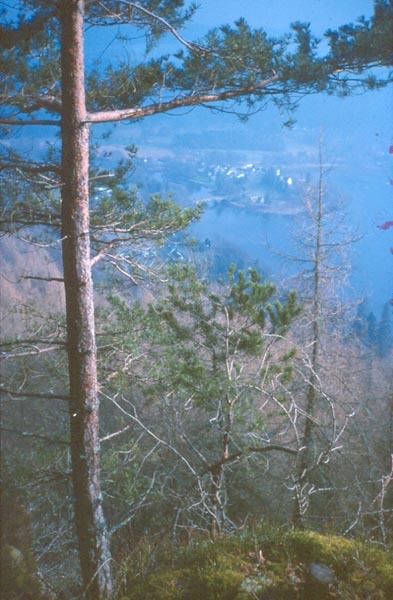 Occasional glimpses of Kenmore and Loch Tay can be snatched through breaks the woodland cover. The track curves left, passing a small mesh enclosure, to arrive at a wide junction. Cross the track running from right to left here and continue up a track on the opposite side. This disappears into denser coniferous forestry. A kilometre on, the track reaches a fork where there is a black mountain bike route marker post. Take the left hand option and prepare for a strenuous climb up to the top of the hill. The way is open but thick woodland lines the route and there are plastic reflector posts placed at intervals. The track curves left and after a stiff pull emerges at a tall metal aerial sited within a fenced compound of sheds. A narrow path branches right just before this to a viewpoint on top of an open mound. As the track approaches the gate to the compound, it passes through a stone wall. Before it does, a path bears off to the right, following the wall into the forest. Take this and descend through tall Scots Pine trees. Stay with the wall and avoid a couple of sets of tracks on the right. The path levels out at a T-junction where there are mountain bike marker posts again. Go left here and descend across an open area of bracken and larch to enter the trees again. When you emerge on to a track at the bottom of the path and turn right to reach the wide junction again. Head west along the track to the wooded viewpoint a kilometre on. This makes an ideal picnic spot. From there, retrace steps to the start. Map OS Landranger 1:50,000 sheets 51 or 52. Start/parking Mains of Taymouth Forestry Commission car park (grid ref NN 772460). Grading An easy walk on forestry track and path suitable for all.